The easy way to wash your clothes without a washing machine. The Scrubba Wash Bag is a rare thing, a real innovation, not just a variation on a well-worn idea. Basically, the Scrubba lets you wash your clothes without a washing machine or having to hand wash over a tub or in a stream. It gets better results than hand washing and with a lot less effort. 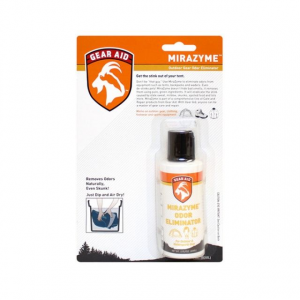 While only the most obsessive washers are likely to take a Scrubba on a multi-day hike, it is great for base camp, hut, or vehicle based day hiking and for travelling generally. 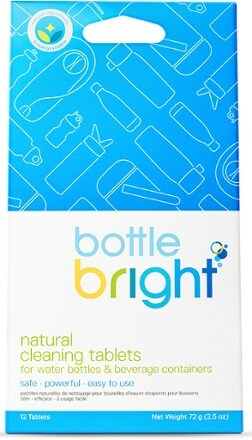 The Scrubba Wash Bag is like a sturdy version of the familiar roll-top dry bag but with some additions. The most important addition is a large area on the inside with raised dimples or bumps that grab the clothes as you knead the bag, aiding washing. The Scrubba also has a clear panel along the side that lets you see how much water you have in the bag (there are marks on the side as a guide for how much to add) and an air relief valve for getting the last of the air out (see Tips below). 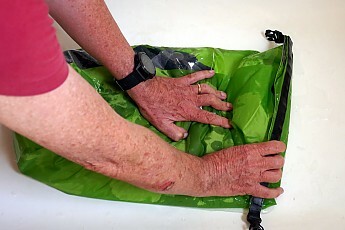 With a conventional dry bag the bag keeps the water out so the contents stay dry. 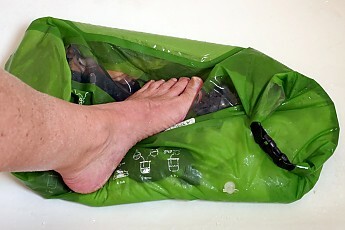 With the Scrubba, the bag keeps the water in. 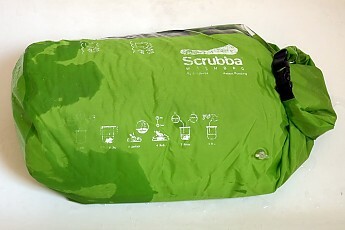 You could try an ordinary dry bag for washing but I think the dimples on the inside of the Scrubba make a big difference. 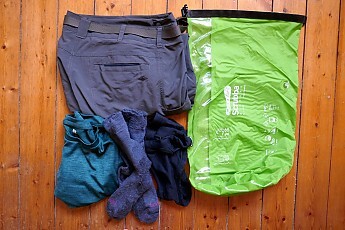 The Scrubba is big enough to wash one day's clothes (shirt, trousers, socks, and underwear) or two days if you leave out the trousers. To use the Scrubba, put your clothes in, add about a couple of teaspoons of liquid detergent and fill the bag with water to the line appropriate to the amount of clothes. 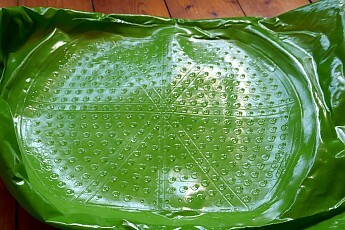 Next, lay the bag down to get most of the air out then roll over the top three times like a dry bag. Getting the air out is important for effective washing, so the air valve allows the last bit of air to be squeezed out after you seal the top. To wash, just knead the bag for a couple of minutes like you would a lump of dough, so the clothes rub on each other, helped by those dimples on the inside. You can also knead it with your foot, as I am doing here. 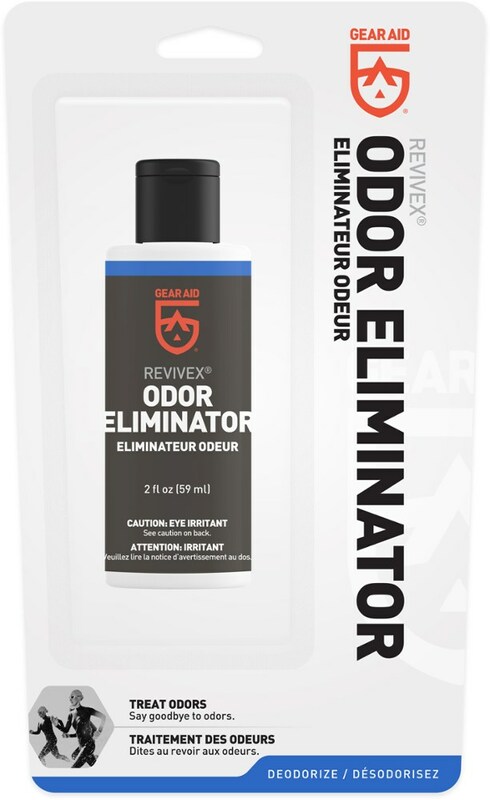 Great if you use it in the shower. 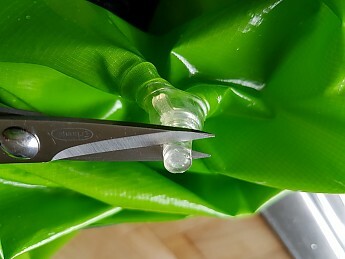 When finished the wash stage, unroll the top of the bag and empty the soapy water out, rolling the bag as you do to squeeze out the excess water. 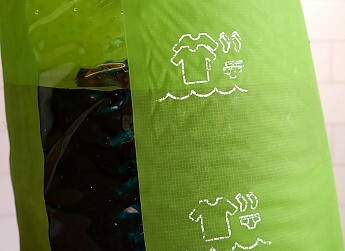 Next fill the bag with clean water to the recommended level, and repeat the wash sequence (fill to line, close top, get rid of air). Knead it again as for washing. Half a minute or so seems enough for rinsing. Empty the bag, squeeze out the excess water, and repeat the rinse for a second time. You should now have clean clothes although a bit more hand wringing will help them dry faster. I have used the Scrubba many times over the past two years and so far it looks like new apart from a bit of printing wearing off. 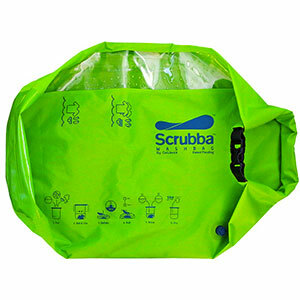 If there is a shower where you are staying, washing with the Scrubba is even easier. I put the clothes, detergent, and water in before I shower then knead the Scrubba under my foot as I wash myself. It is also easier to rinse the clothes under the shower. You could probably wash with the Scrubba without getting the outside or your hands wet, but I tend to be "enthusuastic" so I have never achieved this. Using it in the shower solves the problem. Any sort of liquid detergent seems to work. I use shampoo or, if available, dish-washing liquid. I have not found the need for special laundry detergent. Saves carrying extra liquids. For me, a good routine is to wash yesterday's clothes each morning so I normally have a clean, dry set of clothes by the the next day. The Scrubba weighs only 140 g (4.9 oz), about the same as a T-shirt. Because it makes it easy to wash every day, I need only carry one or two spare sets of clothes, reducing overall carry weight, regardless of how long I am travelling. Thanks for the helpful review of the Scrubba, Ian! It's an interesting product, though I admit I've always been thrown by the pricetag. It's good to know it works for you and is useful. Thanks! What a coincidence on timing. I was in the Boundary Waters last week and my son had an "accident" in his hammock one night. To wash everything, I grabbed one of my $6 OzarkTrail dry bags (it was leaky), and used it as a washing machine, sans detergent. This would have been a useful tool in my pack. Thanks for posting!